Chemical extraction procedures (e.g. sequential extraction schemes) are widely used for preliminary classification of soils and/or different soil strata with regard to the mobility and plant-availability of trace metals. However, the reliability of these procedures is often questioned, mainly due to readsorption of extracted metals and non-selectivity of methods. Depletion of metals in the vicinity of plant roots promotes their transfer from solid phases into solution. Plants can actively mobilize essential metals, like Fe, Cu or Zn, from solid phases under deficiency conditions. Under non-deficiency or excess conditions, soil properties rather than plant physiology determine whether or not soil-associated metals will respond to local depletion. For this reason, an understanding of both solution chemistry (i.e. free metal ion activity) and solid phase supply processes (e.g. as characterized by operationally defined phases) is necessary to be able to predict metal bioavailability to plants. A new approach, the effective concentration concept (CE), tries to combine both aspects by means of the so-called 'diffusive gradients in thin films' (DGT) technique. A metal chelating resin is placed in the soil, to lower the local dissolved metal concentration, and hence to mimic plant uptake. Principally, this technique reduces, like a plant root, the local metal concentration in the soil solution and, hence, induces a metal supply from solid phases. So, fluxes to the resin and corresponding concentrations can be measured based more on kinetic than thermodynamic equilibria. Like plants, DGT responds to the labile metal pool resupplied from the soil solution and solid phases. Measured DGT fluxes can be quantitatively related to the effective metal concentration (CE), a measure directly related to plant metal uptake, encompassing both soil solution concentration and its enhancement from the solid phase. Altough CE is largely determined by soil properties and depends on deployment time and thickness of the diffusive gel layer, it may provide a measure of the potential hazard of metal-contaminated soils. Recent studies show that DGT-labile species exclude strongly bound organically complexed metals as well as colloidal species not supposed to be utilized by plants, but include labile solution species, like inorganic and fulvic complexes, and clearly reflect the supply of kinetically labile metals from solid phases. So far, most soil scientists agree that the free metal ion activity of the soil pore-water, rather than dissolved or total concentrations of metals, controls metal bioavailability to micro-organisms and plants. However, new studies indicate that metal toxicity also depends on labile metal forms, and that information is still scarce about the factors and processes determining the intricate, dynamic relationship between free, labile and non-labile metal species. Due to the large size of the labile relative to the free metal ion pool, and the even larger metal reserve in soluble non-labile forms and various soil particulates, the free metal ion activitiy seems to be well buffered. (Kabala and Szerszen, 2002). Assessing the pool of solid-phase metal that can buffer dissolved metal concentrations was one reason, why researchers have sought to identify soil extraction techniques that measure that particular pool. However, no clear evidence was found yet to indicate which solidphase may best correlate with uptake by plants or soil animals. At best, soil extraction methods can integrate an indication of the soil capacity to supply a certain metal (metal release rate) (Allen, 2002). Qian et al. (1996) evaluated the bioavailability of metals (Ni, Co, Cu, Pb) in soils, from various rural regions in China, to plants (winter wheat Triticum aestivum, alfalfa Medicago sativa) in pot-culture experiments, under greenhouse conditions (after 40 days), by means of the Tessier-method (see section 5.4.2.1) and multiple regression. Total soil concentrations were as expected poorly correlated with plant metal contents. Also no significant correlation (except for Co) was observed between plant metal concentrations and individual soil fractions. However, a stepwise multiple regression analysis using combinations of various soil fractions as independent variables could predict the observed variability in plant uptake, indicating that SEPs (sequential extraction procedures), though operationally defined, may provide valuable bioavailability data for metals in soil. The corresponding regression equations for Ni, Cu and Pb are listed in Table 5.13. In a recent review, Schramel et al. 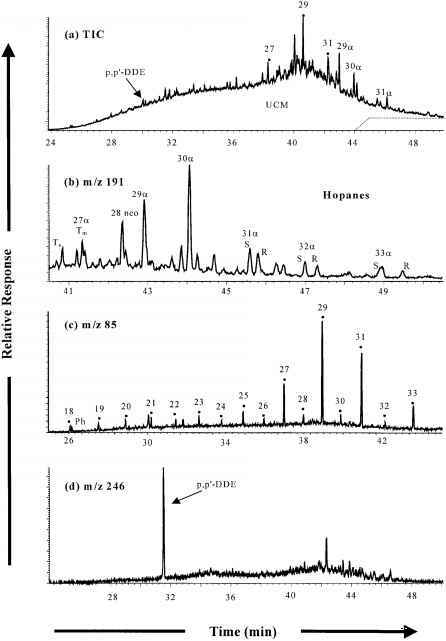 (2000) examined several single and sequential extraction schemes developed to assess Cu mobility and bioavailability in contaminated agricultural soils. They found that both EDTA and acetic acid are widely used as extractants for plant-available Cu species, while deionized water, NH4NO3 and CaCl2 extract more electrostatically weakly bound metals representing mobile phases in the soil. By means of own experiments, no vertical Cu translocation was found in hopfields, although Cu was highly plant-available. 1 M NH4NO3 is now used as the standard method of assessing metal bioavailability for regulatory purposes in the Federal State of Baden-Württemberg, Germany (DIN 1995). Concerning the determination of total metal concentrations in arable and non-arable soils, Hseu et al. (2002) very recently reviewed currently used acid digestion methods. They found that beside the classical 'aqua regia', different combinations of concentrated acids (HClO4, HNO3, H2SO4, HF) are used by most research groups to extract the total metal pool in soils (see for more details section 5.4.4). The reliability of sequential extraction procedures has been questioned also for soils mainly due to the obvious redistribution of the extracted metals during the procedure. Although there have been many attempts to standardize a soil-extraction protocol, the ideal extraction reagent will always depend on the specific needs of each study (see recent review by Reuther 1999, and Allen 2002, and compare to section 5.4.4). Van Herck et al. (2000) used the 'MINTEQA2' chemical speciation code to predict metal concentrations in leaching soil solutions, minerals that precipitate and the pH of the leaching solution at equilibrium. By comparing the calculated and experimentally obtained leaching data with results derived from a sequential extraction scheme, the authors could verify the accuracy of the extraction method they used. Ho and Evans (2000) used radiotracer techniques to quantify the observed redistribution of Zn and Cd during a modified 'BCR' extraction procedure ((BCR = EU Bureau of Chemical Reference Materials; ref. given therein). In the soils examined, about 20-30 % of Cd and Zn released from the acid-soluble fraction of the soil was readsorbed to the following reducible oxide phase. However, most readsorption for Zn and Cd occurred already after the 1st extraction step and the exact extent of readsorption varied with soil type. The authors infer, however, that the extent of readsorption was less than previously announced and does not invalidate SEPs for these metals. The 'BCR protocol' was used because it is one of the more standardized extraction schemes today and so easier to perform and to reproduce. In addition, a certified reference sediment (CRM 601), available from the 'EC Measurement and Testing Programme' was used as standard against the 'BCR procedure'. By adding radioisotope tracers of Zn and Cd into the extraction reagents, the authors could directly quantify redistribution effects and consequently correct the results for these metals. But radiotracer metals are not introduced in the same form as that in which their stable counterparts may occur naturally and hence do not represent the true actual metal partitioning. They can just be an indicator of the metal in solution, but not in the soil. Isotopic exchange occurs very rapidly and a steady-state partitioning of radiotracers (Zn and Cd) among the various soil fractions is obtained within minutes. For this reason, the authors conclude that, although partitioning of added radiotracers can not be used as an accurate substitute for stable metal isotope measurements, it is possible to make soil-specific corrections with regard to readsorption effects and to recompute metal partitioning in the BCR soil. By this way it seems possible to yield true amounts of operationally defined soil fractions. Conder and Lanno (2000) used a weak electrolyte (0.1 M Ca(NO3)) soil extraction method and could demonstrate that extractable metals (Cd, Pb and Zn) in spiked artificial soil were precisely related to the LC50 toxicity to the earthworm Eisenia fetida. The authors postulate that this type of soil extraction represents a good surrogate measure of the metal bioavailability in spiked soils. In addition, mixture toxicity measured by the 'toxic unit approach' (TU) could well reflect the additivity of single observed toxic effects (see also section 7.2). Wang et al. (2002) used a sequential chemical extraction scheme to demonstrate possible differences in heavy metal speciation and bioavailability (Cr, Ni, Zn, Cu, Pb and Cd) occuring between the rhizosphere and bulk soils, as well as between air-dried and wet soils. Speciation differences were observed for all elements, both between the rhizosphere and bulk soils, and between air-dried and wet soil samples. Correlation analysis indicated a better correlation between the exchangeable/carbonate-bound metal fraction in the rhizosphere wet soil to the plant metal concentration, in comparison to air-dried or nonrhizosphere soils. Therefore, the authors recommend to apply rhizosphere wet soils in future metal speciation and bioavailability studies on soils. Interesting in this context also another finding of the authors that precipitation of Fe(OH)3 due to the liming of metal-contaminated forest soils prevented an increase in soil pH, and was the reason why only minor effects on the free and exchangeable Cu and Ni pool (BaCl2 + EDTA-extractable) were observed. Urban soils often exceed trace metal regulatory levels. But the actual threat posed by metals depend on their speciation in soil solution rather than on total concentration. Murray and Hendershot (2000) found up to 59 % of the dissolved Cd in urban soil solution in a free ionic form. In contrast, most of Cu, Pb and Zn occurred as organic complexes, and >40 % of Ni as inorganic complexes at pH values > 8.1. A multiple regression analysis revealed that neither the free nor the dissolved or total soil metal pool was a good predictor for the metal uptake by plants in the field. However, it was shown that pH and total metals in soil were significantly correlated with the activities of free metal ions, except for Cd2+, which only had a weak correlation with soil pH. Chemical extraction and analysis indicated that the selected trace metals were mainly in stable solid forms and bioavailability was extremely low in these urban soils. There are many processes affecting the supply of metals to plants, including diffusional and consecutive transport to roots, which encounter fresh surfaces on their way through the soil, but also including the influence of particular root microenvironments and exudates. Depletion of a metal concentration in the vicinity of roots allows the transfer from solid phases into solution. And kinetically labile solid phase metals allow a corresponding rapid transfer into solution. Under deficiency conditions, plants can actively mobilize essential metals, like Fe, Cu or Zn from such solid phases. Under nondeficiency or excess conditions soil properties rather than the plant determine if a metal fraction responds to local depletion. For this reason, to predict metal bioavailability to plants, an understanding of both solution chemistry (i. e. the free ion activity) and solid phase supply processes (e. g. by operationally defined phases) is required. However, applying the FIAM to soil systems is not as simple as its application to aquatic systems, due to the lack of considering dynamic processes responsible for maintaining that free metal activity, including biological uptake. Metal bioavailability in soil solution seems not only to depend on the chemical availability but also on the soil's capacity to supply and maintain a certain level of free ionic metals. Zhang et al. (2001) tried to combine both aspects by introducing the effective concentration (CE) concept, which includes the use of the 'diffusive gradients in thin films' (DGT) technique. Placing a metal chelating resin into the soil, lowers the local dissolved metal concentration and hence mimics plant uptake. Principally, the same is happening when using the DGT technique, which locally reduces, like a plant root, the metal concentration in the soil solution and, hence, induces a metal supply from solid phases (see Figure 5.2). It simply acts as a physical surrogate of plant uptake by interposing a diffusive gel layer between the resin and the soil, through which ions and complexes can diffuse freely. From this, fluxes to the resin and corresponding concentrations can be measured based more on kinetic than equilibrium principles. Like plants, by lowering local concentrations in the soil solution, DGT responds to the labile metal pool resupplied from soil solution and solid phases. The measured DGT metal flux can be quantitatively related to the effective concentration (CE), which is directly related to plant metal uptake, and encompasses both soil solution concentration and its enhancement from the solid phase. The DGT concept is based on our understanding of diffusional processes occuring in the rhizosphere. If the CE can be directly related to plant uptake, it may provide a measure of the potential hazard of metal-contaminated soils. As expected, Ce is largely determined by soil properties and depends on the deployment time and of the thickness of the diffusive gel layer. Another membrane technique, the "Helmke-Donnan Membrane Technique" (HDMT) has been developed for the direct measurement of soil solution activities of metal ions. Here, free metal ions are allowed to equilibrate across a negatively charged ion-exchange membrane. Once equilibrium has been established, the solution on the acceptor side of the membrane can be analysed for metals by traditional analytical methods (FAMEST, 2000). Measurements of CE of copper were made by Zhang et al. (2001) on 29 different soils covering a wide range of concentrations both as EDTA-extractable Cu and as free Cu2+ activity, and these levels were compared to Cu concentrations in Lepidium heterophyllum (pepperwort) grown on these soils. Here, L. heterophyllum was used to lower, like the DGT devise, local soil solution Cu concentrations, due to a fast transfer step. This does not disregard other transfer processes where plant uptake is slow, but indicates that for Cu, resupply from solid phases was supposed to be the controlling step in the soil. In fact, plant Cu was linearily correlated with CE, but was more scattered and nonlinearly related to the free Cu2+ activity, the EDTA-Cu or soil solution concentration. This may indicate that diffusion and labile metal releases are dominant supply processes, which the DGT-soil system mimics best. Also quantitatively, CE proves to be an accurate measure of the true Cu bioavailability in these soils (see also section 5.6). At CE > 2 mgCu/L, plant yield decreased sharply on all soils indicating severe Cu phytotoxicity (see also chapter 7). It has been shown by others (cited in Zhang et al. 2001) that DGT-labile species exclude strongly bound organically complexed metal and colloidal species supposed not to be utilized by plants, but include labile solution species, e. g. inorganic and fulvic complexes along with the kinetically labile supply from solid phases. The authors further discuss if the free ion activity model can be applied when membrane transport is so slow, so that no local depletion of metals occur. From their results they conclude that the kinetically labile solid phase pool of metals plays an important role in plant uptake and is part of the DGT measurement. 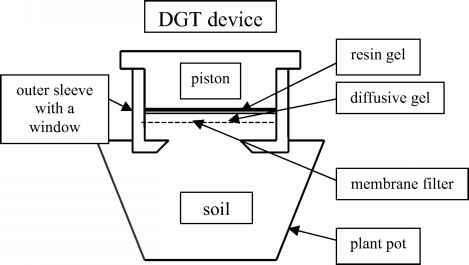 DGT devices may provide a major step forward to assess the potential hazard to plants of metal contaminated soils by means of major geochemical data. Although being only a small fraction of the dissolved soil metal concentration (e. g. for Cu and Pb between 10-8 and 10-10, and for Cd between 0.002% and 13%; see Allen 2002), evidence is accumulating also in soil research that it is by and large the free metal ion activity in the soil pore water, rather than total or dissolved metal concentration, which mainly controls metal bioavailability to soil microorganisms and plants. By determining the soluble Cu and free Cu2+ activity in the pore water from 22 soils with total Cu concentrations varying from 19 to 8645 mg/kg, Vulkan et al. (2000) found that the percentage of free Cu2+ in the total soluble Cu fraction varied from 0.02 to 96 % and was influenced mainly by pore water pH and less by DOC. For example, at soil pore water pH > 6, free Cu2+ was less than 1 %. Porewater samples were also analyzed by two bioluminescence-based bacterial biosensors, i. e. Escherichia coli and Pseudomonas fluorescens. The response of P. fluorescens correlated better with pCu2+ than with total soluble Cu, whereas E. coli showed a correlation to both Cu forms, with EC25 and EC50 values of pCu2+ for the two biosensors of 5.8 and 5.0, respectively. Previous work also done by the authors showed that biosensors reacted also in the same way to free Zn2+-ions in the pore water of sewage sludge-amended soils (ref. given therein; see section 5.5.7). Although there was a fairly good correlation between soluble Cu and the total soil Cu content, kd values ranged widely from 515 to 9294 L/kg. Also expected, soil pH and DOC were the main kd influencing factors, but went in opposite directions, as can be seen from the obtained regression equation: log(kd) = 1.74 + 0.34 pH - 0.58 log (DOC). The equation explained only 42 % of the observed variability of kd indicating a large uncertainty in the attempt to predict kd solely from soil properties (pH, DOC). In contrast, variations of Zn (and Cd) were much smaller and soluble Zn mostly < 1.0 mg/l. Also pore water pCu2+ was mainly influenced by soil pH and total Cu concentration according to: pCu2+ = 1.79 pH - 1.47 log(total Cu) - 0.53. McBride and Martinez (2000) investigated the speciation of Cu in a highly Cu-contaminated soil (3000 mg/kg dw) after amemdment with metal-adsorptive materials (see also section 5.5.7 below). Total soluble (measured by ICP-MS) and labile (measured by ASV) Cu concentrations partly decreased, but none of the amendments was able to reduce soil phytotoxicity as indicated by bioassays. How intricate the situation can be, was shown by the addition of Mn oxide (birnessite), which on one hand lowered the free Cu2+ concentration, but on the other hand phytotoxicity persisted, probably due to an increase in DOC and hence of soluble and labile Cu forms. The toxicity of Cu to maize shoots appeared to depend on labile as well as free ionic Cu forms. The intricate and dynamic interrelationship existing among free, labile and nonlabilepools of Cu in soils is illustrated in Figure 5.3. 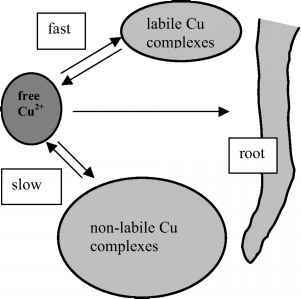 The authors conclude that due to the large size of the labile pool relative to free Cu2+, and the even larger Cu reserve in soluble nonlabile forms and soil solids, the free Cu2+ activitiy may be very well buffered. This would explain the observed lack of reduction of the Cu2+ activity upon treating the soil with various amending materials.